Description: Lined up at the Metra depot on the MILW West Line. 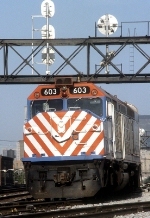 Title: Metra 603 At Western Ave. Description: Yes, this is a color shot.